Pomegranates are one of the best-tasting things on this little blue ball. You don't eat the peel or flesh, of course. The prize is the arils inside. Each one is a ruby-red seed encased in a juicy pulp. And the flavor is a perfect mix of tart and sweet. Pomegranates are a nutrient-dense food, rich in phytochemicals and overflowing with protective health properties. Studies show a strong correlation between pomegranate consumption and improved health of the cardiovascular, skeletal and nervous systems. The pomegranate is an anti-oxidant powerhouse. The juice has more protective power than any other because it contains the most of every type of antioxidant. It has more antioxidants than red wine, grape juice, green tea, acai berries, cranberries or blueberries. Drinking pomegranate juice inhibits viral infections and protects against dental plaque. A single pomegranate provides 40% of your daily requirement of Vitamin C. It also contains high amounts of vitamin K - which helps support bone health - and vitamin B5, helping your body metabolize protein, carbohydrates and fat. The fruit is rich in magnesium, zinc, iron and calcium, too. Pomegranates contain compounds that stimulate serotonin and estrogen receptors. They improve memory, even helping prevent the postoperative memory dysfunction often associated with heart surgery. They relieve osteoporosis by reducing the inflammation that causes pain and stiffness in your joints. They even help protect against cognitive impairment and depression. The great thing about pomegranate fruit is that the trees on which it grows can live for many years. Aside from being a great décor for a backyard… it produces the delicious pomegranate fruit. Pomegranate fruit have a round, spherical shape. Inside, you’ll find dozens of small ruby-colored seeds. The pomegranate fruit has a citrus flavor and is very juicy. 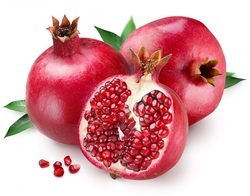 There are many drinks and even foods that are made with the pomegranate fruit. The pomegranate fruit is now becoming more commercialized and can be found in supermarkets in a variety of forms. The most popular is pomegranate juice but there are also pomegranate jellies, pomegranate wine, and even pomegranate salad dressing. The wide adoption of the pomegranate is due to recent studies that have shown that the fruit contains a high amount of antioxidants that are beneficial to our health in many ways. 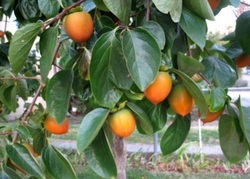 The Japanese or Oriental Persimmon is a native Asian plant that has been in cultivation for many centuries. The tree grows as a multi-trunked or single-stemmed deciduous tree to 25 feet high and wide. It is a lovely ornamental tree with drooping glossy green leaves and branches that give it a flowing, rather tropical look. The leaves offer a nice display in Fall, turning to dramatic shades of yellow, orange and red. Tea can also be made from fresh or dried persimmon leaves. The beautiful orange or reddish fruit in Fall hangs long on the tree to give additional ornamental value. This Fall ripening period makes persimmons very popular with hunters to attract wildlife. The fruits are classified into two categories: astringent and non-astringent. The non-astringent is as crisp as an apple when ripe. However, astringent varieties must ripen to be very soft before it can be eaten. If not, it will be a very bitter experience for you. But once ripened, the astringent varieties are as sweet or sweeter than non-astringent varieties. Japanese persimmons do best in areas of moderate Winter temperatures (USDA 6-10), however they may tolerate short periods dipping to 0°F when fully dormant. Nutritional Value: fiber, Vit C, B, minerals, anti-oxidants, flavonoids.